It’s hard to pinpoint exactly when I really discovered horror fiction, but it was probably when I was about thirteen or so and happened to discover a copy of “Assassin” by Shaun Hutson on a market stall. The cover art was wonderfully grotesque and vaguely reminiscent of the old 1980s video nasties with “PREVIOUSLY BANNED” stamped on the cover which I used to notice in video/DVD shops but, unfortunately, looked far too young to actually buy. Of course, after noticing the thankful lack of an “18 certificate” on the cover of “Assassin”, I bought it immediately. It was nothing like any of the watered-down Young Adult “horror” stories I’d read before and it seemed exactly like what I imagined the “PREVIOUSLY BANNED” horror movies would be like (of course, when I eventually bought a few of these, I was actually kind of disappointed…) It was gruesome, it was nihilistic and it was the coolest thing I’d ever read! Naturally, I became a fan of horror fiction ever since then and I also soon wanted to be a horror writer too. Had I never discovered that novel when I was thirteen and, paradoxically, had I actually been allowed to watch all of the “video nasties” I’d seen in the shops back then (rather than letting my imagination make them out to be far creepier and more grotesque than they actually were) then I wouldn’t be the writer that I am today. Hell, there’s probably a parallel universe somewhere where I never really got seriously into writing/fiction purely on account of ignoring that copy of “Assassin” when I was thirteen. Although I hardly ever write proper horror fiction these days, it’s still a genre which is very dear to me. It’s also a surprisingly difficult genre to write in – or rather, to write well in – so I thought that I’d offer some tips and advice for anyone who is just starting out writing horror fiction or just wants some advice about writing proper horror fiction. The kind of horror fiction which will genuinely scare both your readers and you too. You have been warned. 1) It should scare, disturb and disgust you when you’re writing it: I’ve mentioned this briefly in my article about emotions and writing but this is the most important part of writing good horror fiction. It should scare you. You should tap into the darkest and most disturbing depths of your imagination when you’re writing it and you should be viscerally disgusted/disturbed by yourself when you’re actually writing it (and probably for a while afterwards too – so, for the sake of your sanity, it’s probably a good idea to find a way to relax and get into a better state of mind to use after you’ve finished writing before you even start writing). Good horror fiction, paradoxically, requires you to be both as fearless and as afraid as possible when you’re writing it. It’s an intense experience and certainly not for everyone. If you’re doing this properly, then for every horror story you finish writing, there should at least be one or two unfinished story ideas or drafts which you’ve left unfinished because you were just too creeped out, disturbed or disgusted by them to carry on writing. 2) Characterisation, characterisation, characterisation: I cannot emphasise this enough. Many horror novels, splatterpunk novels especially, just aren’t that scary for the same reason that most 1980s/90s American slasher movies aren’t scary. There isn’t enough characterisation. Or, to put it another way, the writer hasn’t made the reader care about and empathise with the characters enough to make it genuinely distressing and horrifying when they are placed in threatening situations. But this doesn’t mean that all of your characters have to be “everyman/everywoman” type characters or even particularly sympathetic characters, it just means that your reader should be able to see them as a distinct person with their own feelings and motivations rather than “generic character #14” or whatever. 3) Avoid cliches: Yes, formulaic genre horror may be good fun to read and write. But it isn’t scary. Good horror should surprise and shock your readers, it should be innovative. It should be unexpected. It should be unpredictable (but should still make sense. Hmmm… I really need to write an article about foreshadowing sometime). The best advice I’ve ever read about keeping your horror fiction fresh and innovative is to read widely in other genres too. This is true. You’ll learn a lot more about characterisation, storytelling, pacing etc… if you read widely and it also means that your imaginatin will be filled with a lot of things which it wouldn’t be if you read pretty much nothing but horror novels. Also, read widely within the horror genre too – both to avoid cliches and to find which sub-genre of horror you are most drawn to. Just make sure to read other stuff too. 4) Pacing and suspense: This is similar to the age-old advice about swearing in fiction. If you do it too often, it dilutes it’s impact. Likewise, writing a genuinely scary horror novel where literally every page is practically drenched in blood is nearly impossible to do (the only exception to this I can think of is possibly “Body Count” by Shaun Hutson). This is for the simple reason that your readers will not be particularly shocked after a while, they’ll just become cynical and jaded. To use a cliched metaphor, writing a good horror story is probably like writing music, every song needs silence. Without silence, music would be nothing more than noisy static on an old radio. It probably wouldn’t be that much fun to listen to. The same applies to writing horror fiction (and writing thriller novels) – you need to give your audience a “rest” between horrific scenes in order to both build up suspense and to avoid diluting your own work. This doesn’t mean that the “rest” scenes should be boring and, in fact, they should contain things which hold the reader’s interest and move the story forward. But they should give your reader a break from horrific things, so that when the next gruesome death happens or when the next monster appears etc… your reader is truly shocked and surprised, rather than indifferent. In fact, if you’re really clever, you can use these “rest” scenes to include more subtle psychological horror which lingers in the reader’s mind long after they’ve put the book down. If you want a perfect example of this, then check out “In The Miso Soup” and “Audition” by Ryu Murakami. The horrific parts in these novels are no more gruesome than a scene from the average splatterpunk novel – but they’re about ten times as shocking because they don’t happen nearly as often as they would do in the average splatterpunk novels. And there is a lot of suspense too – from the cover of the book, you know that it is not going to end well, but you don’t know when…. 5) Atmosphere: This is extremely important for all horror stories. It doesn’t matter whether your story is an old-fashioned ghost story which is set in a crumbling old manor house or whether your horror story is a gory splatterpunk sci-fi novel set in a nightmarish post-apocalyptic future. Good horror needs atmosphere. It’s kind of like the bass in a heavy metal song. Most of the time, you probably won’t really notice it – but, without it, the song wouldn’t sound anywhere near as good. The kind of atmosphere you should try to create for your horror stories is either one of bleak nihilistic despair, a sense of an unreliable reality and/or a sense of grim foreboding. There are many ways to do this, but it is best if it’s done in a more subtle way (eg: through descriptions of places, through dialogue etc…) throughout the whole novel rather than in an overly dramatic way in just one or two scenes. It should be almost subliminal. Certain types of atmospheres are best suited to different types of horror fiction. For example, a sense of an unreliable reality is much more effective in more “psychological” horror stories and ghost stories where the protagonist (and, by extenion, the reader) can never be quite sure whether they actually saw what they thought they saw or whether they are going insane. For a perfect cinematic example of this, check out a Satoshi Kon movie called “Perfect Blue” – although I should warn you that it is an extremely disturbing film. For a much less disturbing, but still creepy example, check out an episode from series four of “Futurama” called “The Sting”. Likewise, if you’re writing a story about zombies, then one way to make it truly scary is to create a palpable atmosphere of bleak hopelessness. After all, no matter how many zombies the protagonists manage to kill, there will always be more. The world can never return to what it was before the zombie apocalypse happened. All that the survivors can do is to stay alive for as long as they can until they inevitably die and join the ranks of the undead. Even if they survive for decades, they can never let down their guard and they can never live a truly happy or peaceful life. Zombie fiction, at it’s best, can be depressing as hell. 6) Know when to let the reader use their imagination: This is something of an art form but, when it’s done well, it can make a horror story truly terrifying. One of the things which was so groundbreaking about the splatterpunk genre when it appeared in the 1980s was that it actually showed what many horror writers had previously only implied or left to their reader’s imaginations. Splatterpunk was a necessary step in the evolution of horror fiction – but, showing literally everything or hiding literally everything are just as bad as each other in dramatic terms. One comes across as nothing more than theatrical melodrama and the other comes across as censorious cowardice. The real trick to writing genuinely creepy horror is to use a mixture of these two things. Show a few gruesome things, really gruesome/horrific things, so that your reader knows what kinds of things you’re prepared to write about and then leave some of the other gruesome/horrific parts in your story to their imagination – this will make your reader think “Wow! That MUST be horrific if she won’t write about it. I mean, after all, she wrote that scene where….” And their own imaginations will probably come up with far worse things than the things you were actually thinking of when you wrote that particular scene…. The trick to leaving things to the reader’s imagination is to show just enough details so that the reader has a general sense of what has happened, but doesn’t quite know exactly. Their imagination will have to fill in the gaps. These details can be fairly grotesque, but they should not explain or show everything. Think of writing these scenes like writing a scene in a detective novel or TV show. The detective usually does not see the crime itself, but they usually find clues which tell the audience what has happened. Or they hear witness statments from people who heard the crime happen or saw some side-effect of it but didn’t actually see the crime itself. So, there you have it, a few tips and tricks for writing a horror story which will truly haunt your readers. Just don’t have nightmares when you’re writing it. In fact, forget that. Have nightmares when you’re writing it – and then use them for inspiration…. This entry was posted in Fiction, Writing and tagged creativity, horror, writing. i enjoyed reading this post, it will help me with my new journey as i dive into horror fiction, finding my feet/wings. keep the good work up. 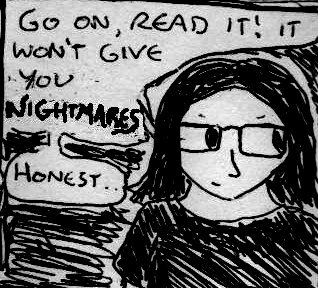 A really good article on tips for writing horror fiction. I am finding myself drawn to writing horror fiction. I think I am rebelling as a reader after decades of reading about sugary romances! Thanks for wasting my time. A blog about writing in which the author can’t even write. Loads of grammatical and spelling errors. I don’t often comment on this kind of thing, but holy hell. You might be retarded. But, yes, you’re probably right about this particular article – back in the early days of this blog, I wasn’t quite as careful about proofreading as I am now (this was probably also a consequence of posting my articles online on the same day that I wrote them). These days, I usually tend to run most of my articles past a spell-checker before scheduling them to be posted several months later, allowing for additional editing before publication (although I still sometimes make a couple of typos in my early drafts. I’m only human, after all). Still, I wish you all the best of luck with finding more suitable reading material than this –quite obviously – error-riddled insult to the English language.